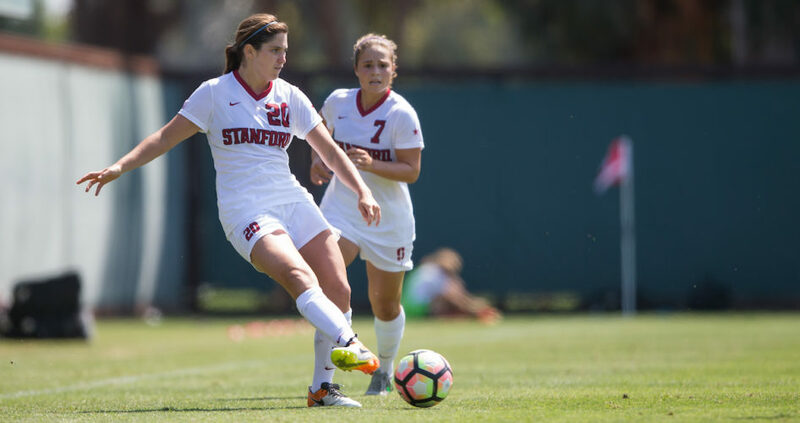 Upon retirement from a successful four years as a Stanford soccer player and, more expansively, the 18+ years I’d dedicated to the sport, I had a lot to consider. What did I want to do with the next chapter of my life? Surrounded by classmates and friends who were actively interviewing for job positions, and seemingly, securing job offers left and right, I felt discouraged. How did they know which types of jobs to apply for? And once they received an interview, what were they saying and doing that impressed the interviewer to extend an offer? While I’d enjoyed the classes I’d taken over the past four years at Stanford, it was difficult to translate how my education would fit into the real world. I didn’t know where and in what role I wanted to start my career. And when I did rashly apply to jobs, I didn’t have any internship experiences to speak about because I’d dedicated my summers to training and conditioning for the upcoming soccer seasons. My resume reflected my ‘lack of experience’; I could hardly draft a full page of involvement, activities, and accomplishments. There was no way I could compete with other job candidates who flaunted their cultural, exciting, and relevant activities. After graduation in June, my plan was to pursue a 9-month Master’s in Technology Management at the University of California, Santa Barbara (in large part, because of my interest in the program and its curriculum, but also due to the fact that it was one of my only options). While unknown at the time, this was one of the greatest decisions I’d ever make. In addition to the learnings from the classroom, the extra 9-months as a student allowed me to focus on my interests, dedicate time to exploring different career paths, and build confidence in my past accomplishments. By devoting myself to exploring and developing my career, I found a new way to talk about myself and my past experiences with employers. When it came time to interview for jobs near the end of the 9-month program, I learned just how valuable the experiences I’d had as a soccer player were. I could respond to any (yes, any) behavioral interview question with an example from my time on the Stanford soccer team. Any athlete can speak to learning from failures, accountability, time management, perseverance, giving and receiving criticism, and being part of a team. I was no longer worried about what once was my short and meager resume. I learned how to translate how my experiences on the soccer field applied to situations in the workplace. I understood that there are a vast number of skills that I’d learned from being part of a collegiate soccer team that were admirable and sought after in the working world, and I used this to my advantage. After a few cycles of interviews at different companies, I ultimately decided on a company and a role that would allow me to contribute immediately and grow professionally by using the broad skill set that I’d refined from collegiate sports. Six months have passed since I started a Product Management role in Santa Barbara, CA at a company called Procore. While I certainly have had to adapt my working style from that of a student to that of a young working professional, I’ve felt well equipped to do so. I am learning everyday. Admittedly, there are many challenges and obstacles I face, but my experience playing collegiate soccer has given me tools and strategies that are largely applicable to the problems I encounter. Procore is a perfect place for a former athlete. Let me explain. One of Procore’s values is Ownership.This was very attractive to me as an interviewee because of my background in sports. Collegiate sports require athletes to dedicate unwavering effort towards their goals. For the Stanford soccer team, and likely for most other college teams, our goal was to win the National Championship each year. Winning a National Championship is a large and lofty goal that can only be accomplished by boiling it down to a plan and backing that plan by action. As part of a team, each student-athlete must be accountable for doing their part. They sacrifice participating in other university activities, having a social life and other experiences, in the hopes that they can achieve this goal. The Procore workplace is no different. My team has a shared, lofty goal. We strategize how best to go about achieving this goal and take ownership of our designated tasks. The ability to think with clarity, tune out distractions and get work done is critical for the teams’ success. I found that falling into this routine was second-nature because of the many times I’d executed something similar with my soccer team. Valuing ownership is just one of the things I love about Procore. Procore also values Optimism and Openness. They promise their employees mastery, autonomy, and purpose in their work. I could list many more facts of Procore’s culture that allow me to utilize the skills I’ve learned from sports. This culture is what motivates me to come to work energized everyday, reminding me of the days past when I used this motivation on the soccer field.